Home / Unlabelled / Why Was the Qiblah Changed From Jerusalem to Makkah? Two momentous events in the life of Prophet Muhammad (peace be upon him) bear special significance as regards the institution of Prayer (Salah) in Islam: The Mi`raj (the Prophet’s Ascension) and the change of the qiblah from Jerusalem to Makkah. There is general agreement among Muslim scholars that the Prophet’s Night Journey and Ascension occurred in the month of Rajab, most probably on the 27th of that month, about a year before the Hijrah (the Prophet’s emigration from Makkah to Madinah); and the change of qiblah happened in the middle of Sha’ban, about sixteen months after the emigration. Muslims believe that during the Prophet’s Mi`raj, God instituted the five daily obligatory Prayers for believers. And it was in the middle of a congregational Prayer in Madinah, that God’s command came to the Prophet about the change of qiblah. 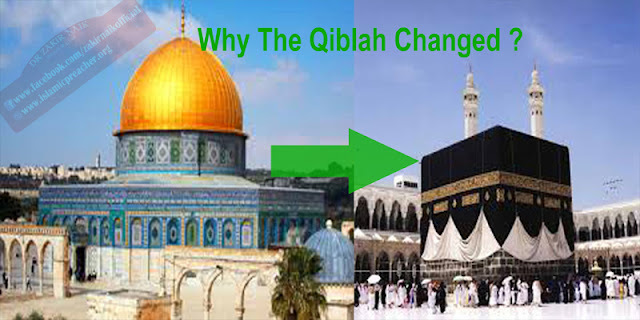 “The fools” in this context are those who criticize the change of qiblah, without any understanding of the matter. Before considering the meaning of the change of qiblah, we need to understand the importance of what is called the qiblah for Muslims. For Muslims, none of the daily Prayers can be done correctly without knowing the qiblah. “Qiblah” means orientation, or a sense of true direction. At the beginning of every Prayer, the Muslims face the house of God in Makkah, thereby spiritually connecting themselves along an invisible line that passes through every point on earth, to the spiritual center in Makkah. Whether they pray alone, or in congregation, they do so as part of the greater community of Islam. Thus, five times a day, each Muslim is aligned to the other Muslims who form concentric circles around the Ka’bah encircling the earth. Imagine watching the scene from space; and we may see all the Muslims at Prayer like a huge flower the size of the earth, opening and closing its millions of petals. Each of those petals represents a Muslim at Prayer. Thus the qiblah (which is unique to Islam) has a significant role in bringing together every nation, race, and tribe on this planet regularly five times a day, so as to link them to the common center at Makkah. Being central to the worshipers in Islam, the qiblah serves as the heart of the Ummah of Islam, supplying life-blood to the spiritual existence of Muslims all over the world and keeping the concept of unity in every sense of the term: God is One, the religion is one and the Ummah is one. Every time we stand in Prayer, Muslims may say they make a spiritual journey to the Ka’bah in Makkah, somewhat as the Prophet did during his Night Journey to Jerusalem. And from the Ka’bah, our spirit travels upward towards Allah the Almighty just as the Prophet during his Ascension from Jerusalem. So for a pious and sincere worshiper, every Prayer he performs involves Night Journey and an Ascension, as it were. During his Ascension, in a mystical experience of immense spiritual significance, Prophet Muhammad (peace and blessings be upon him) led all the earlier prophets in Prayer in Al-Aqsa mosque at Jerusalem. This was a wonderful event that symbolized not only the oneness of both the houses of worship — the Ka’bah and Al-Aqsa — but also the oneness of the guidance of Allah given through all the prophets. Because Prophet Muhammad was sent as the final prophet for the whole of humanity consisting chiefly of the children of Abraham by his eldest son Ishmael, and the second son Isaac, (peace be upon them both). Jerusalem represents the line of Isaac, as Makkah represents the line of Ishmael. The foregoing highlights the significance of both the cities serving as the qiblah of Muslims: First Jerusalem and then Makkah. The final prophet born in the line of Ishmael, the first son of Abraham, at Makkah was commanded to turn to Jerusalem for Prayer; and then as a significant turning point in the process of the completion of the religion of Islam, God asks Prophet Muhammad to turn to the first house of God in Makkah for worship. In the above verse the use of the expression, “an Ummah justly balanced that ye might be witnesses over the nations” is particularly noteworthy. Muslims believe that Prophet Muhammad is not to be considered the prophet of just a region, a race or a nation any more. Rather, he is the prophet of the whole of humanity; and the community of believers will be a justly balanced middle nation with Makkah as its center. Jerusalem, representing the earlier versions of the religion, was not the qiblah any more. Makkah, representing the patriarch of mankind Abraham and all his children, was to be recognized as the center of the completed religion of God. This means that the change of qiblah had far more significance than most people at that time understood. According to the Quran, Prophet Muhammad and his followers were named “the best of peoples” as well as “a justly balanced society”, deserving of leading the whole of humanity to the path of God. That is to say, the change of the qiblah is a declaration by God of the perfection of the first religion as the final religion for mankind. Through the two mystical events in the life of the final messenger, Muhammad, God completes and perfects the religion for humanity and declares the Ka’bah in Makkah as the center of the world as well as of His religion. And those who recognize and accept this cannot be parochial or ethnocentric; they have got to be above race, region or nation; they have to be at the center as a justly balanced middle nation serving as “witnesses over nations” as the true representatives of the whole of humanity.